Cleaning snow and ice off of your vehicle can take 25 minutes or more. 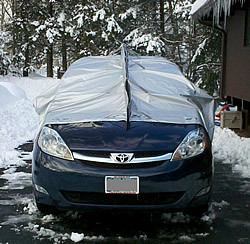 Only the Auto Snow Shield allows you to remove the snow and ice in under 60 seconds. 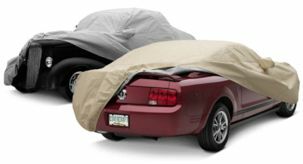 The Auto Snow Shield is easy to install, covering the windshield, the roof, the side windows and in most cases the rear window. Six flexible hook tie-downs can be bent around any part of the vehicle which is convenient for securing the cover. Two easy pull handles located on each side. One size fits most mid-sized vehicles, all coupes, sedans, small wagons and small to mid-sized SUV’s and crossovers. 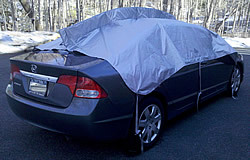 Auto Snow Shield is made from Reflec’tect, a silver urethane coated polyester fabric and comes with 1 year warranty. Before placing the Auto Snow Shield on your vehicle attach one side of the cover to the other via the hook and loop strips found on the inside section of both vertical fins. Make sure each fin is lined up to the other evenly. With the vertical fins attached to each other, lay one side of the Auto Snow Shield flat over the other so it can be carried to and placed on the vehicle. 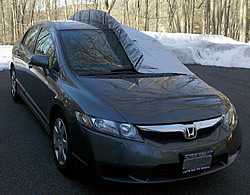 Lay the folded Auto Snow Shield over half of the vehicle and then pull the folded half of the cover over the other side of the vehicle. Once the Auto Snow Shield is unfurled over the vehicle make sure the vertical fin is in an upright position and is centered in the midline of the vehicle. Once you’re satisfied with the positioning of the Auto Snow Shield, use the tie-downs, located by the handles and the four corners of the cover, to hook onto the vehicle. The tie-downs located by the handles can attach to the bottom of the vehicle while the one located at the four corners of the cover can attach to the wheels or wheel wells of the vehicle.